Innofreight has become involved in another freight transport sector – the transport of liquids, more precisely the transport of calcium carbonate. Calcium carbonate, also referred to as lime carbonate, is refined to particle sizes only a few thousandths of a millimetre wide and held in suspense in a liquid. This method is called suspension and yields a so-called slurry, a lime milk of uniform quality with a specific density of 1,700 to 2,000 kg per m³. Slurry is predominantly used as a filler in the paper industry. 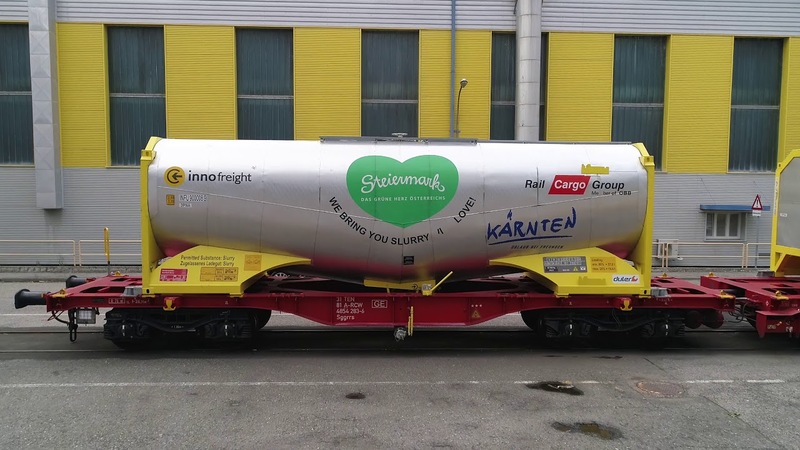 In a further logical step, Innofreight will turn its attention to new developments in the field of special transports of liquid mineral oil products as hazardous goods. For both the transport of hazardous and non-hazardous liquids, the proven Innofreight concept of separating bed and superstructure will be continued. The InnoWaggon with two SlurryTainers creates a payload of 142 tons.